As writer Brian Michael Bendis wraps his X-franchise run in concert with the universe-ending Secret Wars, the flavor of “character spotlight” issues hangs heavy. There’s only so many installments left for everybody to tell their respective stories – every panel and page needs to count like never before. Yet, creators and fans alike have favorites and almost by public decree, former BFF’s Kitty Pryde and Illyana Rasputin embark on a delightful side-story that is as much winking retro salute as it is affirmingly forward-facing. For anyone reading comics roughly thirty years ago, the Pryde/Rasputin sisterhood is an instant hallmark of (relatively) simpler times. The two characters drifted apart, changing dramatically throughout the years with few and far between their meaningful interactions. It’s a lot like the recent treatment taking place with New Mutant contemporaries, Sunspot and Cannonball, in the Avengers books – except if the best friends devolved into Wolverine and Cyclops. That may be too “next-level” an analogy for some but the bottom line is that there’s a good amount of friction throughout. It’s healthy and cathartic but, most importantly, it’s the glue that keeps this issue from just being fluff. 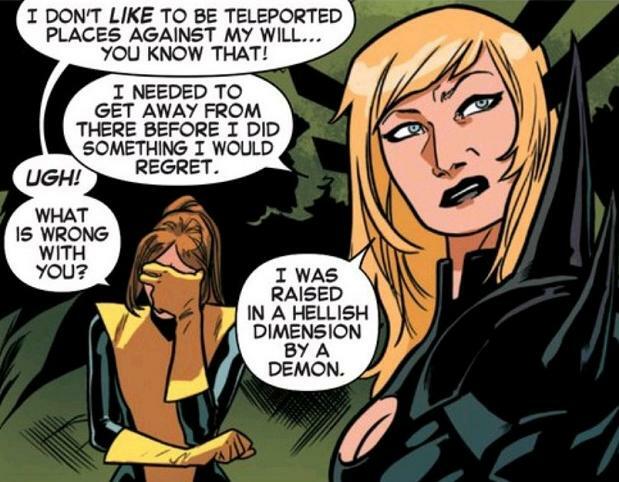 Bendis sends Kitty and Illyana (“Killyana”? “Killy?”- they need to work on this!) to Monster Island of Fantastic Four and Mole Man fame in search of a mutant in distress. Dialing back in on the core X-mandate seems a sure way to center a book after much ambling afield, so kudos there. However, the timing logic of their jaunt is a bit wonky. 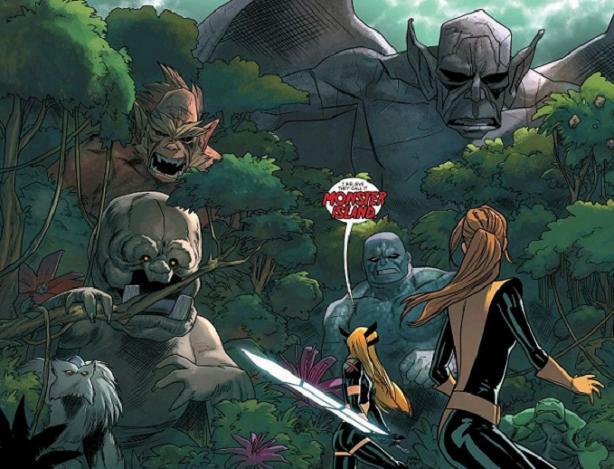 Magik going on these “missionary expeditions” is commendable in itself, so pairing it as a reactive storm-off to Scott Summers closing the Xavier School (aka “bunker in the woods”) is rather unnecessary. It works better in context of their abrupt departure last issue but does excessively undercut the greater intention. If Illyana’s going on this trip regardless, the script should reflect her picking one frikkin’ track instead of half-assedly serving both plot devices. Xemnu the Titan is actually partial to an afternoon spent searching out Captain Beefheart vinyl, rewarded with a double-double…. Recurring artist Kris Anka is a refreshing, if not curious, choice from the bench. His simple and expressive understatedness might not exactly be the first thing springing to mind involving such a scope but given the all-female lead cast, it’s an elegance that really works against the bombastic and burly backdrop of classic Atlas Comics-era Kirby/Ditko monsters. That said, Anka brings a completely different vibe to the piece. 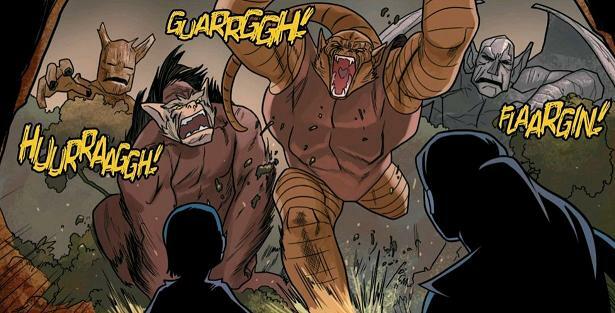 It’s not unlike Stuart Immonen drawing the similarly cartoony Fin Fang Foom equivalent in Nextwave. Regular alternate, Chris Bachalo, may have been too on-the-nose to deliver the precise beat punctuation and sometimes the inability to unwatch a giant dragon in purple undies needs a different interpretive filter (metaphorically speaking). Who ordered the abnormally large muppet? As straight-ahead as the main premise is, the issue still suffers slight narrative confusion. 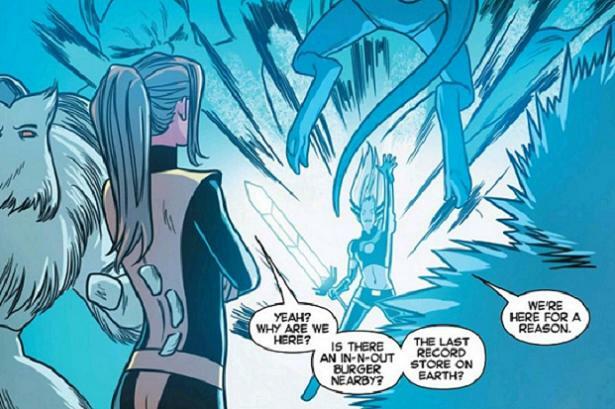 The passage wherein Kitty and Magik encounter the new mutant, Bo, is a bit ambiguous. A combination of vague lighting, unclear delineation, indistinct word balloon origination and broken English dialogue results in quite a jarring read. The intent/significance of the monster holding Bo as some sort of captive/teddy bear also warrants multiple re-reads. Although pictorially intensive, things are not spelled out as implicitly as they could be. The monster could actually be a manifestation of the girl’s power until disclosed otherwise! Even “proto-Groot” gets in on the action! Bendis’s preferred sentence structure also being what it is is a mixed bag for the affair. Having to resort to a sentence invoking back-to-back uses of the word “is” just illustrates the “structural-isms” that are the preferred writing style of that guy who is Bendis. At times needlessly circuitous for the sake of sounding “conversational”, it’s still all done in good nature, but sometimes- ya know? Woof! This week’s Uncanny X-Men boils down to a few key selling points: nostalgia for either Claremont-era X-camaraderie or vintage pre-Marvel Monsters. If you are a fan of either (or both), this is a light-hearted in-and-out, one-and-done transcending occasional disconnects. So, points if you can take these high notes and power through some “huh?” in stride. Perhaps not the most striking offering from the volume overall yet memorable all the same. This week’s Uncanny X-Men boils down to a few key selling points: nostalgia for either Claremont-era X-camaraderie or vintage pre-Marvel Monsters.